In some countries, children with Down syndrome are educated in mainstream, or regular, classrooms alongside their non-disabled peers. 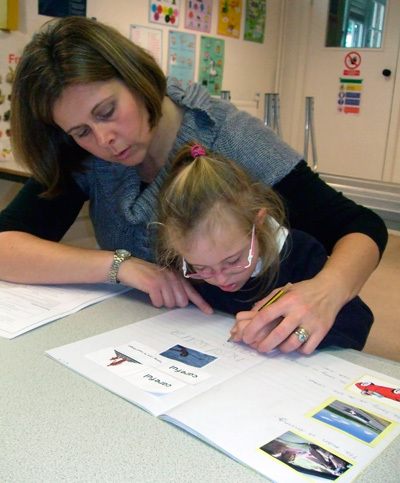 Educational research suggests that there are distinct advantages to inclusive education. 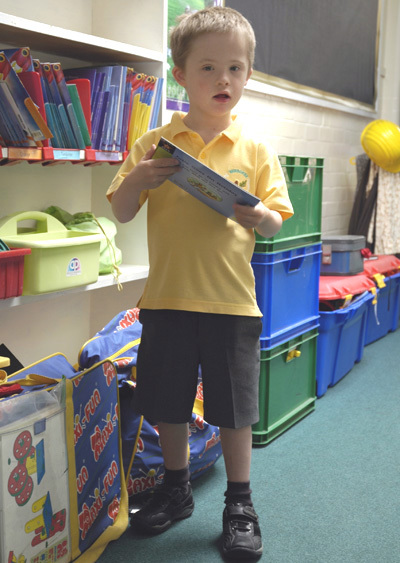 Since the 1980's an increasing number of children with Down syndrome are being educated in regular or mainstream classrooms with non-disabled peers. A number of educational research studies have considered the benefits or disadvantages of being in a mainstream compared with a special education classroom. Gert de Graaf and colleagues published a systematic review of the studies conducted from 1970-2010 in a number of countries and conclude that results show that children educated in mainstream classrooms develop better language and academic skills even after selective placement is taken into account. There is no difference in outcomes for self-help skills possibly because many of these are learned and practiced at home. For social networks, behavior and social competence there are few differences or small advantages to mainstream placements. The children are well accepted by their peers but less often seen as 'best friends' and support for friendships in and outside school is recommended. The evidence of the benefits of mainstream inclusive education has led to an increase in mainstream placements for children with Down syndrome in preschool and from the start of full-time education in some countries. de Graaf, G. & de Graaf, E. (2012) Development of self-help, language and academic skills in Down syndrome. Paper presented at 11th World Down Syndrome Congress, Cape Town, South Africa. de Graaf, G., van Hove, G. & Haveman, M. (2012) Learning to read in regular and special schools: a longitudinal study of students with Down syndrome. Paper presented at 11th World Down Syndrome Congress, Cape Town, South Africa. Burgoyne, Duff, Clarke, Snowling, Buckley, Hulme (2012) Efficacy of a reading and language intervention for children with Down syndrome: an RCT. Journal of Child Psychology and Psychiatry 53, 1044-1053. http://onlinelibrary.wiley.com/doi/10.1111/j.14697610.2012.02557.x/full.